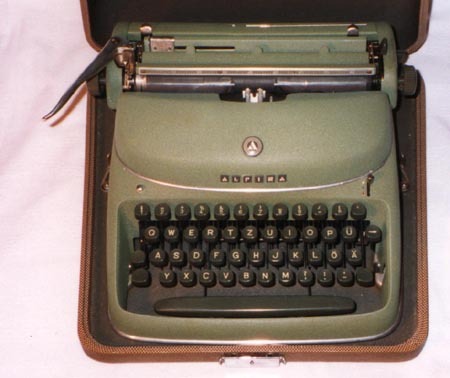 One variety of portable typewriter has gained quite a following due simply to the wonderful and individualistic styling applied to it. This is the ALPINA, from West Germany. In addition to being distinctively shaped, these machines are in fact magnificently constructed and are, as the leading ALPINA expert Norbert Schwarz says, "actually small office machines." Alpina Buromaschinenwerke AG was founded by Dr. Rudolph Bovensiepen in Kaufbeuren, W. Germany in 1951. The company at first manufactured only portable typewriters (and never did make standards), but later added mechanical calculators to its line. The machines were initially available in only one model; the machine at right, part of the Norbert Schwarz collection, is one of these. It has no serial number. There were four basic models in the ALPINA line. First two introduced 1952; last two added 1958. The firm Alpina Buromaschinenwerke continued in its original form until 1961. In that year, the company was sold to Standard Electrik Lorenz, which was itself owned by the enormous International Telephone and Telegraph Corporation, usually known as IT&T. 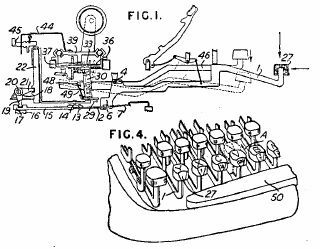 Production of typewriters continued, and adding machines were brought out; but the typewriter production in this phase was brief. 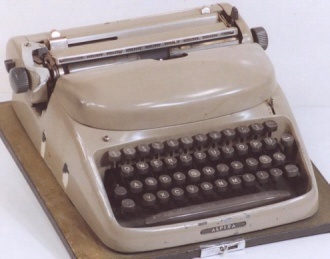 In 1963, production of typewriters was ended. The assets of Alpina were sold in 1964 to the Vorwerk Group; from sometime in the late 1960's until 1972 a private individual by the name of Oscar Mildner owned the company. It was dissolved in 1972. Another rare variant (also from Norbert Schwarz) is the SAFETY-TYPER, which uses a dotted typeface to emboss checks, and is as much check protector as typewriter. It is a modified ALPINA DT33. Click the button to view machines made from 1960 until the end, including the machine with the highest known serial number. At left is another one of these early machines; this ALPINA shot comes to us from Tilman Elster. This machine bears serial number 3177. 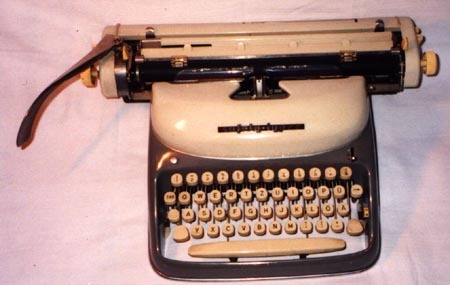 Machines of this style were produced through serial number 5200, which was reached sometime in 1952. After this time, a line of machines was introduced in place of the single model, and the styling was quite dramatically altered. 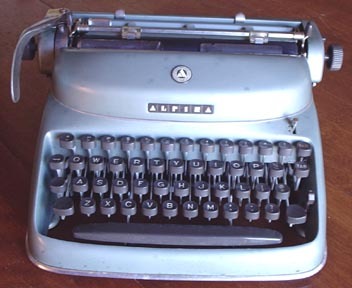 The new Alpina machines featured a distinctively rounded top cover, which would remain on all machines of this make until the end -- although it did vary slightly between some models, and over time as well. 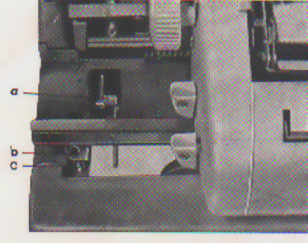 The first rounded machines had the "Alpina" logo on the front frame, as seen above and below, but later this was moved to the more familiar position on the ribbon cover. Here are two of Norbert Schwarz's machines. On the left, s/n 14188, and on the right, s/n 25774. By existing records, both date to 1954, and so the change in decor can be fixed in that year. Note the change in location of the emblems between the two. The small metallic button above and to the left of the keyboard is the margin release. 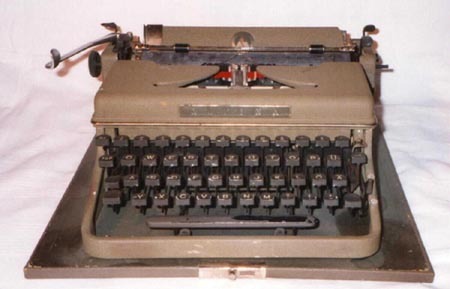 Later machines of different models use a conventional key on the keyboard for M-R. Both are model SK24. The alterations in the product line are confusing, but seem to center around the above mentioned change in 1952 and another in 1958. 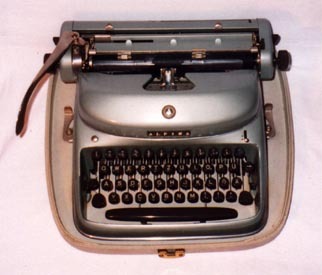 Some machines were larger in overall size, and alterations were made in keyboard arrangement. Key-set tab stops were also now available. At left, my Alpina, s/n 134,564 dating to 1958. There is now a small lever on the right side of the keyboard, barely visible in this shot; it is used to set and clear the tab stops remotely. It is a model SK24 -- the machine has changed, but the model designations have not. On the right, courtesy Norbert Schwarz, is Alpina s/n 144,996. This also dates to 1958 but is the new model KBS, according to Norbert. 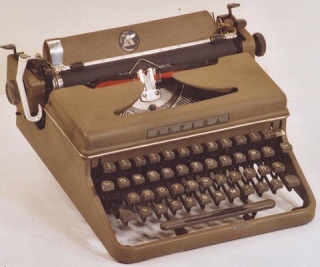 It retains keyboard arrangement features of the old pre-1958 machines, and it may be true that KBS production did not run much longer than this time period. Alpina may have been 'running out the stocks' of older internal parts. Speaking of parts --- Norbert informs us that the very early Alpina machine seems much like a Triumph, and I've noted that the type-bar mechanism of late machines seems close to that of Olympia portables. How's THAT for intrigue? 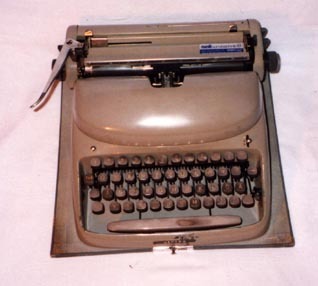 After 1960, most standard-width carriage machines of this line used a solid nylon carriage return lever, which had to be rotated into position either for typing or for storage. These appear to be a milky white plastic in appearance. At right, overall plan view of a post-1960 machine. These differ, again, in very small respects. One notable feature of Alpina machines is that, while they employ carriage shift, only the platen actually moves when the shift keys are depressed. This makes shifting rather easy considering the size and weight of these machines -- these are among the very biggest and heaviest portables in the post-1958 enlarged overall size. 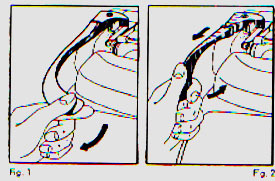 Late machines have a quick release feature that allows removal of the entire carriage in just a few seconds, with only several simple operations. This was intended to be an aid to maintenance, and was not normally required except for deep cleaning of a machine in storage. Other engineering features included spring-steel type bars, and a novel design of touch regulator which was located under the top cover. Every possible point of design was made superlative in these machines, which were certainly expensive to manufacture. The Alpina DT33 and variants thereof contain one highly original feature. On these machines, the lowest row of keys not only depresses normally, but also pushes in and in so doing actuates the various stops for the decimal tabulator. The markings for the stops are found on the space bar, right below each key. 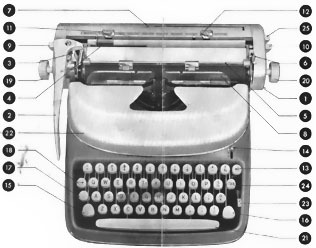 On the left is original patent material for this feature; note the keytop, (27) with arrows to indicate both vertical and horizontal motion.